The reigning league champions recorded an impressive twenty one point victory over Raheen on Saturday evening in Edenderry. Playing against a gale force wind in the opening half the reds were very impressive as they cut the Raheen defence open time and time again and goals courtesy of Ciaran Hurley and Sean Doyle gave them a 2-5 1-2 half time lead. Ciaran Farrell opened the scoring after two minutes and with fifteen minutes gone the league champions held a 0-5 0-1 lead with Ciaran Hurley(2), Alex Kenny and another point from centre forward Ciaran Farrell. Two goals in four minutes from Ciaran Hurley and Sean Doyle extended Edenderry's lead to 2-5 to 0-2 but Raheen finished the half the stronger with 1-1 in the final few minutes. 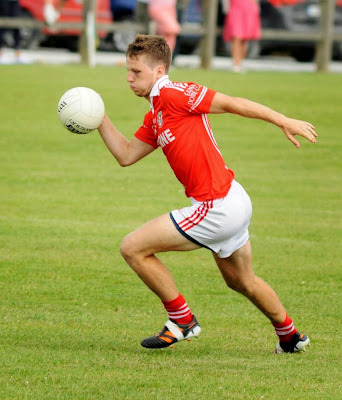 Edenderry now had the wind at their back and they made the most of it and they ended the game as a contest as early as the thirty seventh minute with a point from Ciaran Hurley and a superb solo goal from the returning Stephen Guing. Sean Doyle pointed from a free in the thirty ninth minute and from the resulting kick-out Richie Dalton fielded excellently and a fantastic team move finished with Cian Lawton finishing to the back of the net just twenty seconds after coming on a substitute. The reds were rampant and ran out comfortable winners with further scores from Adam Mahon (2), Mark Young (2), Mark Abbott (2), Alex Kenny and Jamie Dolan. This is Edenderry's last league game before they take on Gracefield on Sunday April 12th in Clonbullogue at 12pm in the championship first round. Their remaining leagues are Clara (away), St Brigid's (home), Ballycumber (away) and Rhode (home) and as it stands they currently require two more wins to guarantee a semi final place. Team: Brian Quinlan, Sean Marshall, Mark Young (0-2), Gary Blong, Adam Mahon (0-2), Sean Pender, Mark Abbott (0-2), Stephen Guing (1-0), Richie Dalton, Keith McGuinness, Ciaran Farrell (0-2), Jamie Dolan (0-1), Sean Doyle (1-1), Ciaran Hurley (1-3), Alex Kenny (0-2, 1f). Subs: Cian Lawton (1-0) for Sean Doyle, Shane Kelly for Keith McGuinness, Aaron O'Connell for Mark Young.